I can’t believe that this is my last Captain’s Log. Where has the year gone? They say time flies by when you are having fun and I have enjoyed being your Captain this year. Thank you to everyone who attended our AGM. We were well supported by 46 Ladies. Though 5th November was not an auspicious date there were no fireworks, just a few sparklers at the end! Congratulations to everyone who won a prize and commiserations to the rest of us. Maybe we will shine in 2016. 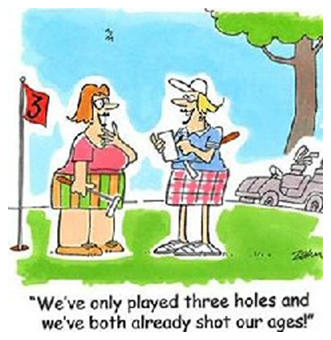 Nine hole competitions are now underway, gratefully received by most ladies, especially on cold, wet days. Organised competitions finish after next week. There will be free practice days on 15th and 17th December for those of you who have made the Christmas cake and the mince pies, bought and wrapped all the presents and decorated the tree. The Winter Invitation was well supported by members and guests. We were lucky with the weather, though that did not help the scoring. Most prizes were won by visitors but well done Pam Blake and Chris Leary for saving us. Several other ladies played well and were disappointed not to win something. Still everyone enjoyed themselves and that’s the main reason we play golf. 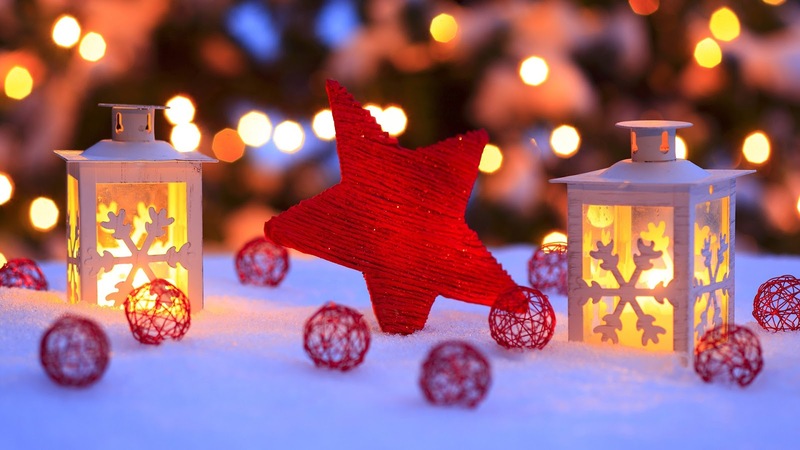 The Grand Finale of 2015 is the Christmas Greensomes and Party Night on December 10th. You are encouraged to bring drink and nibbles for either during the game or afterwards. We will meet in the upstairs room where mulled wine and mince pies will be served. This will help you to cope with Marica’s quiz, which in turn will stop you from becoming too bored whilst waiting for the prize giving. As there are 52 ladies playing in the morning, those who go out early will have quite a wait. You could always go on the driving range, practise your putting or try and bargain with Neil in the Pro shop. 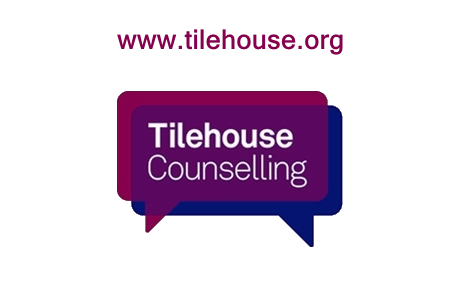 Representatives from Carers in Herts and Tilehouse Counselling will be coming along about 1-1.30pm to be presented with their cheques. 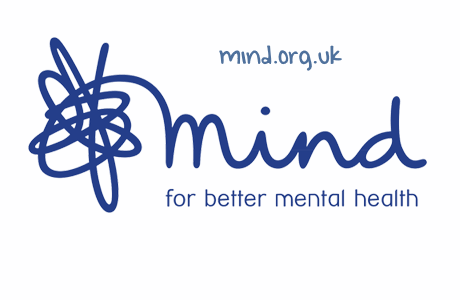 Thanks to your support and generosity throughout this year we have raised an amazing £5,300, which is to be shared between them. Amanda Macknight is also hosting a Coffee and Festive Drinks Morning on Friday 18th December to raise even more money. There will be a Bring & Buy Sale, book stall and the obligatory raffle. Please come along if you can and bring your friends and neighbours. Finally thank you all for your support, encouragement and friendship this year, I have really appreciated it. Thank you to my committee whose help and hard work have been invaluable. I look forward to 2016 and a fun and exciting golfing year under Kathy’s leadership. Good Luck to Kathy and her committee and to all next year’s Team Captains. Today we held our Ladies' Charity Coffee Morning in aid of Carers in Hertfordshire and Tilehouse Counselling. The cakes were made by the Men from the club who competed in the first ever Chesfield Downs Cake Off. Competition was fierce! We had a terrific response of 15 cakes – chocolate, lemon, apple, strawberries and cream, raspberry bakewell, burnt toffee cheesecake and carrot cake. We were stunned by the standard, especially as most of the men had never baked a cake before. Any one of them could have been a worthy winner on the Great British Bake Off. Look out for them in the next series! Judging was done by everyone who attended the coffee morning. Marks were given for appearance and taste but it was extremely difficult to choose a winner, as all the cakes were delicious. Finally, Glen Culmer was crowned the Chesfield Downs Cake Off Champion for his chocolate and orange cake on countback from John Ray’s Black Forest Gateau. All the men were highly praised for their high standards and imagination. Alan our chef, made a stunning centrepiece of a trio of chocolate ganache cakes decorated with shards of three coloured chocolate. This was auctioned for £60. We raised an amazing £500!! Thank you everyone for your generosity. A huge thank you to all the men who took part: Tim Hudson, Mark Smith, Stevie Smith, Phil Chester, Kurt Fallon, Richard Williams, John Ray, Glen Culmer, Chris Birkett, Neil McLauchlan, Rob McCafferty, Ben Williams, Clive Rogers, Rod Unger and Frank Berridge. You were amazing guys, you all deserved to win! Thank you also to Glyn and Ben for their hard work on the day. A special thank you to Mandy Unger for donating the proceeds from the sales of her beautiful hand painted Christmas cards. Solheim Cup fever is officially over until 2017 but if you are having withdrawal symptoms click here to see the photos or watch the slideshow on our website. 18th September was a spectacular day as Chesfield (USA) took on Mill Green (Europe) at home. It was brilliantly organised and choreographed by Lauren and Kathy. Everyone got into the spirit of the occasion and dressed in team colours. Some ladies got carried away with enthusiasm and made their own outfits. The course was a riot of colour that even torrential rain couldn’t wash out, though caddies did have to squeegee the greens! We may not have won the cup as the USA but we definitely won the prize for style. For more info please read Amanda’s poem on the noticeboard. The following Thursday was Autumn Meeting when we played for the Chris Leary Chalice, in fine weather. This was followed by an excellent lunch - who can forget the fruit crumble and custard. The trophy was won by Barbara Baldwin on countback from Chris Bryce and Jenny Feaver. Amazingly they all scored 34 points. Jackie Reid scored 5 points when she had a HOLE IN ONE on the 3rd!! Many Congratulations to her. She also had a birdie but we won’t talk about that! Saturday 26th September was Captains’ Day. We had perfect weather for a Texas Scramble which was enjoyed by everyone. The evening began with Welcome drinks followed by another fantastic meal. It ended by dancing to Ever Gold, an Abba tribute band. 158 people had a great time so it was worth all the stress! Captains’ Day and Evening is a way of saying thank you to members for your support throughout the year and we are very grateful to you all. I would like to mention Joan, Alison and Di for volunteering to run the Half Way House and to everyone who provided the cakes and savouries. On the subject of cakes, Friday 16th October is Charity Coffee Morning starting at 10.30am. This year the format is slightly different as we are holding the Chesfield Cake Off. All the cakes are being made by Chesfield men and you are invited to come along and vote for the best cake. There will be plenty to eat. The men, as always, are being very competitive and have very high expectations. Whether they will meet Paul Hollywood’s standards remains to be seen! I hope as many of as possible will come along and judge for yourselves. Paul Hollywood is sadly unavailable. The notice for the Ladies’ Christmas Party, on 10th December, is on the board. Please sign up and join in the fun. The theme is the Sixties which most of us remember well. Dressing up is optional, having fun is obligatory! We played our final match away at East Herts golf course yesterday. One of my very favourite courses - beautiful fairways and fast greens with lots of slopes and ditches and several raised greens to challenge all of us. It was a very competitive match but played in a really friendly atmosphere, which is how I have found all the Scratch matches this year. Thank you to our team Sarah, Kathy, Pat Ward, Lauren and Chris Newcombe who competed in the first rainy match of this year (and we know Chris hates playing in the rain!!!). Although East Herts are tough opponents, our handicaps held up well away at this course. Naturally, East Herts had the home advantage - knowing the lie of the course was crucial, and especially on the 17th hole - if only I had known that ditch was there!!!! We managed some very close scores - I won on the 18th, 1UP and Lauren and Sarah both took their opponents to the 17th hole - so they were very close matches. A win to East Herts of 4:1 puts them in second place in our division. Brookmans Park is a lovely golf course and we were all delighted when the forecast changed from rain all day to just showers and in fact we played in glorious sunshine - a real bonus. Chris Newcombe and Amanda Macknight were both playing their first match for the Ladies Scratch Team and were, of course, presented with their purple caps. Wear them with pride, girls!! Having beaten their team when they came to Chesfield Downs, Brookmans Park were taking no chances and fielded an extremely strong team today. Even though we all played excellent golf and holes were only lost or won with one shot, they had the home advantage and we were unable to defeat them this time. The result was 5:0 to Brookmans Park. Well done to our team today - Julie, Kathy, Lauren, Chris and Amanda. The result does not really show how close the scores for each hole were. The squad gathered, we were up for the game, the weather would be kind to us and the opposition were friendly!! This was to be a tight match (swinging this way and that). The final score was a draw but each game told a different story. A last minute replacement for Barkway brought us a 15 year old on a 24 handicap who played her socks off and will one day be a scratch player for sure. With three games in we were drawn and with a win and loss to finish the proceedings, we were fairly pleased with a drawn match. (Next time we will have them!!) As always the final result is not the only outcome that makes these games fun to be part of! We enjoyed each game, time with our partners, knowledge to be shared and importantly we had fun!! Many thanks to all who played and to our reserves Lin and Hilary, who sat waiting for the call. Onwards and upwards!! The next match against Mount Pleasant on Saturday October 17th. 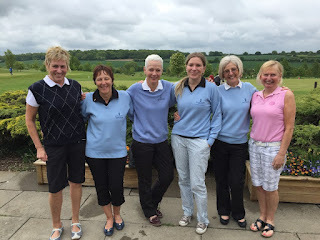 It is amazing and brilliant news that we won our second successive away match today against Aldenham Golf Club. Congratulations to all the team - Pauline, Virginia, Sarah, Kathy & Jackie. And a big thank you to Liz for being our first reserve. Jackie Reid received her Scratch Team cap for playing in her first match - and did us proud with a convincing win of 6 & 4. Pauline Harrison drove the ball straight up the fairways and when that happens, she is difficult to beat - as she proved today. Our next match is on Saturday at Home against Brookmans Park. This club is in the lead in our division at the moment, but they were beaten by Aldenham (who we beat today) - so I have high hopes for the weekend. Congratulations!! Thank you to Kathy Dale and Jackie Reid who have promised to boldly go where no one has gone before! Well, not quite but we are delighted that they are going to lead us into 2016 and 2017 respectively. Their decision ends uncertainty about what would happen to the Ladies’ Section over the next few years. We are very grateful to them and can now look forward with enthusiasm. I hope that this will spur on other ladies to consider joining the committee in future to help run our section. We can’t keep expecting the same people to do all the hard work for us. If we want to continue as a fun and vibrant section doing all the things we want to do then we need people to run it. We all need to play our part. Here endeth the lesson!! Kathy is also to be congratulated on leading the Scratch team to their first victory at Harpenden Golf Club recently. A great achievement and I’m sure the start of things to come. Well done to all the players on the day Kathy, Lauren, Julie, Sarah and Pauline, and also to the rest of the squad who have played so well in their first year of competition. Breaking news! 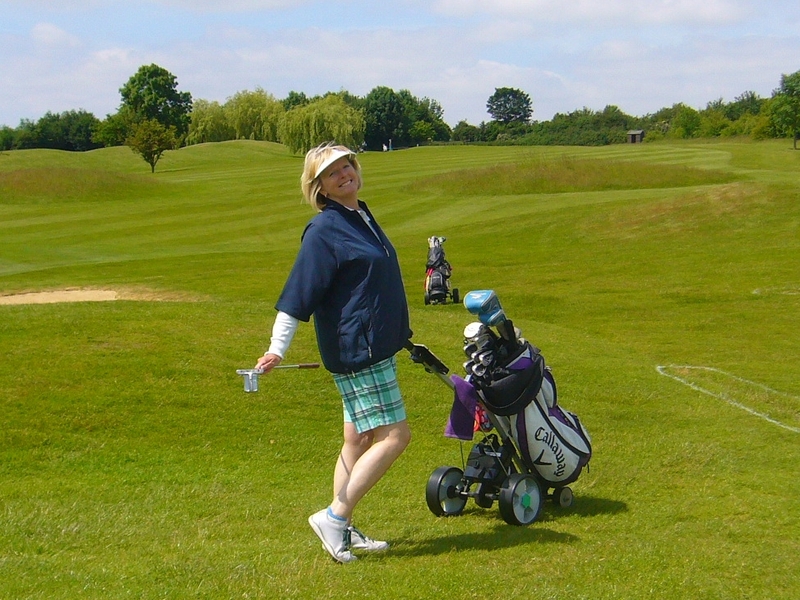 Kathy Carroll and Hazel Brunnen have won through to the Ping Plate Final at Gainsborough Golf Club on 7th September. Well done. 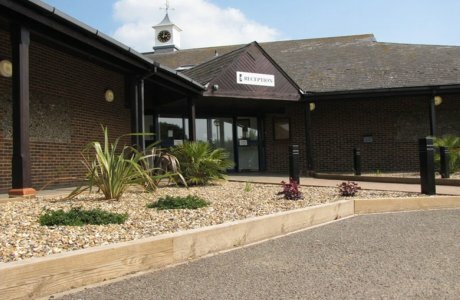 Our representatives at the Help For Heroes Final at Turnberry in October, will be Sarah Faircliff, Jean Ray, Kathy Dale, Diane Chapman and Brenda Harrington. The qualification for this was our Stableford Competiton in June. 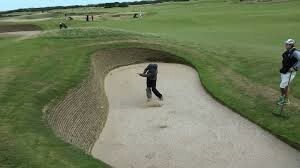 We wish them luck and hope for decent weather and for all bunkers to be GUR! Pass the sand wedges please! September is going to be an action packed month starting with the Solheim Cup against Mill Green on Friday 18th September. Mill Green as Europe were victorious last time so we intend to restore the balance by beating them at home. We hope that even if you aren’t in the team, you will come and show support by waving the flag and dressing in red and white. Volunteers are needed – meet & greet, caddies, sellers of merchandise and of course cakes for the halfway house. Lauren will be whipping up the excitement over the next few weeks. A sign-up sheet will soon be available for the Autumn Meeting and Chris Leary Chalice on Thursday, 24th September. This is a fun day with a meal afterwards and the competition will not be a qualifier! 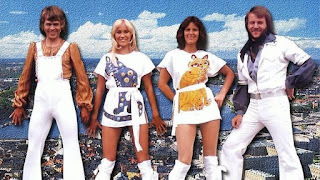 Captains’ Day on Saturday 26th September is proving to be very popular so if you would like to come and support us by playing golf and dancing to ”Abba” in the evening then sign up quickly. All this can be yours for the bargain price of £25 payable to Chesfield Downs’ Ladies’ Section and given to Christine Skeen or put in the black box. See poster for more details. This does NOT conform to the dress code for the evening! Summer is not far away so it’s time to find those shorts and sleeveless tee shirts that have been hibernating at the back of the wardrobe. You might not need them just yet but it’s best to be prepared! Our Spring Meeting, which is the start of the social calendar, was held on May 14th. The bad weather forecast caused it to be only a 9 hole competition but it meant that we didn’t get too wet! Joel and his staff provided us with an excellent meal of chicken in a mushroom sauce with a choice of desserts. The apple crumble was especially popular – too popular as it ran out! Congratulations to the winners on the day and to everyone who collected cups and trophies. For many the biggest excitement was looking underneath their chair for a raffle ticket, which meant winning the lovely plant on the table! A big thank you to the committee and other volunteers for their hard work. On Sunday 24th May we played for the Ken Bird Tankard. This was a very enjoyable game played in good spirit between all four sections. The results were close with only 4 points between all the teams. In spite of a magnificent effort by our team – Pauline, Lin, Julie, Annette, Mandy and Pat – we didn’t win. The Men were again victorious. 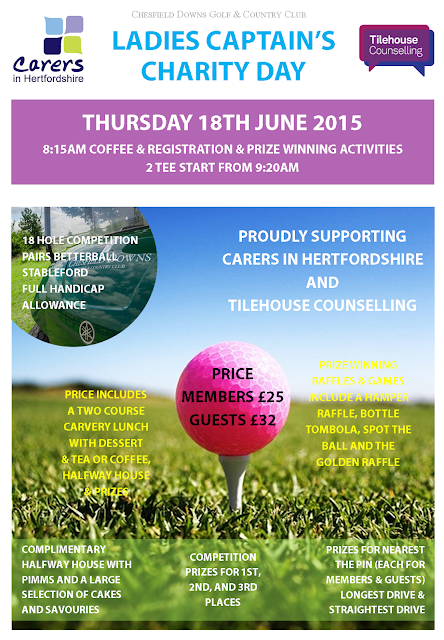 The next big event is our Charity Day on Thursday 18th June. This is in aid of two local charities, Tilehouse Counselling which is based in Hitchin and Carers in Hertfordshire. I hope the weather will be kind to us. A lot of hard work goes into organising the day and we want everyone to have a great time and of course spend money whilst doing so. We still need bottles for the tombola and sponsors for holes and are very grateful for any donations. If you are unable to play, you are welcome to come just for lunch. If you are away then perhaps you could support by donating something or by buying raffle tickets. Join us on Thursday 18th June for a day of fun, food, and prizes! The sign up sheet is on the noticeboard in the locker room. The first day I was on a high literally when after much pushing and pulling I was sitting on the neck of an elephant. It was a long way from the ground. How I wished I'd been going to the gym then maybe I wouldn't have ached so much afterwards! Thailand was wonderful but Vietnam is even better. We had an overnight train ride to the hills of Sapa. The train was another experience but not one I would wish to repeat. However trekking through the hills and the rice terraces made it all worthwhile. The views were stunning and the effort involved must have worked off a few calories. Now I'm into the relaxing part hsving just hsd a trip on the river followed by a chilled glass of wine. The food here is excellent as is the shopping. I started with one bag and now have four! I hope you enjoyed Captains' Drive In. 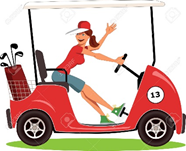 I was sorry to miss it but I hear that Brigid did a fantastic drive - I bet it was down the middle as well! Thank you to her and Marica and everyone who supported them. Thanks also to the stand in or should I say outstanding Captains. I look forward to hearing from the Scratch team and hope you all enjoy your matches. Chesfield Ladies have certainly come a long way. As a bit of entertainment, I thought we could have a caption competition for this edition's photograph. A small prize for the best offering (You can be as rude as you like). All entries to be put in the black box. Don't forget to add your name. Just when we thought the weather was improving, along came the snow to frustrate us! Still I was delighted to see a group of Ladies huddled over their Rules Books when I arrived at the club last Thursday morning. What dedication!! As a result of the weather conditions, Tim, our General Manager has made winter wheels or carry bags mandatory until further notice. This is necessary in order to protect the course from further damage. Winter wheels are on sale in the pro shop, at a good price. If you are unable to carry they would make a wise investment. The Pearson Squad have a very busy month with several matches to play and the Scratch Team play their first match next month. We wish them all Good Luck. The Winter Eclectic finishes on 19th February. We haven’t been too lucky with the weather for this but hopefully we will be able to play the last two rounds. We need to make them count! Scones, jam and cream will be served in the conservatory on Thursday 26th February from 2pm onwards. The prize giving for the Winter Eclectic will take place afterwards. Online Booking for Qualifying Competitions is now available on either the monitor or by using How Did I Do? You can only sign yourself up for a game using this latter method. 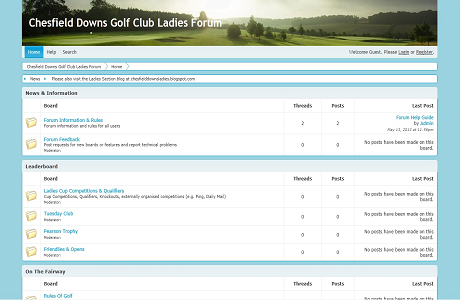 If you wish to sign up with friends then you should use the monitor which at the moment is in the pro shop. You may cancel the same way. Our first game for trialling the booking online system is on 26th February. This is an 18 hole competition but will be a non qualifier. There will be someone available to help in case there are any problems so panic not!! Make sure you have booked in online before then. Our first Cup & Trophy Competitions begin early next month. In order to win one of these you must have played in at least 3 qualifying competitions in the rolling year. Sally has put up a list showing the number of qualifiers everyone has played. If you haven’t played enough you may still play in the competitions but you cannot win. It’s encouraging to see so many Ladies willing to brave the cold, frosty conditions, anything to avoid housework! The weather does seem to be improving but please ensure that you wrap up warmly, Chesfield is always colder than you think. On Tuesday, Sally talked to us about the new system of booking online either on the monitor or on How Did I Do? If you missed this, there are 2 leaflets on the board, which explain the process. It seems fairly straight forward and several Ladies who have played on a weekend are already familiar with it. For our first qualifier on Thursday, March 12th you will need to book online. However there will be a trial run on Feb 26th which will be an 18 hole, non- qualifying competition. 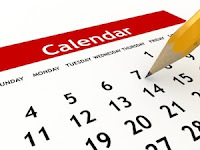 You will be able to book 3 weeks ahead as you can now, so the system will be live from Feb 5th. The Men’s Section already use this so I am sure that we will find it easy! As mentioned previously I have started a Rules Quiz as a way of learning and remembering the most common rules. Hopefully this will help with navigating a way around the Rules Book which isn’t always easy. It is entirely voluntary but there is a bribe of a small prize for everyone who completes the quiz. 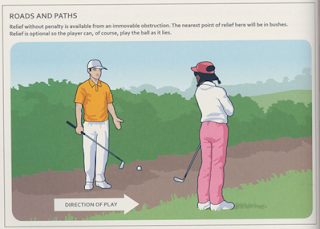 There will be 18 rules, one for each hole, though of course most rules can apply to any hole. If you would like to have a go but have missed some of the questions then just ask me. I will also be putting illustrations on the board of certain Golf Rules. There are several books on golf, in one of the bookcases in the changing room, which you are welcome to take home and look at if you wish. The novels in the other bookcase have recently been changed so please also borrow them. We charge 50p each for these but books on golf are free, so save money and learn at the same time!! Happy New Year everyone and welcome to golf 2015. I hope that you all had a very enjoyable Christmas. New diaries are now available from the pro shop. There have been some date changes made since the diary was printed. As requested by several ladies the Ping Pairs Better Ball competition has been delayed until later in the year. It will now be held on Thursday 28 May when the weather should be good, resulting hopefully in high scores! The O’Sullivan Cup which is a team competition has been brought forward to Thursday 19 March. The Ann Warner and the Maureen Eastwood Trophies which are qualifying competitions will be held on Thursday 30 April. Hopefully these changes won’t cause problems. In case there are any further changes however, always check the noticeboards as well as your diary. I trust that this year will be another great year for golf but just a couple of reminders to help everyone enjoy it. Please ensure that you know the names of your playing partners and if you need to cancel then let them and the pro shop know. Please also arrive in plenty of time to play your game. In the winter months there is more chance that ladies will cancel due to bad weather and this can result in tee times being altered. Congratulations to Julie and Lauren on the birth of their grandsons. I believe Lauren has already ordered his first set of clubs! Adorable baby photos are available to view on demand. 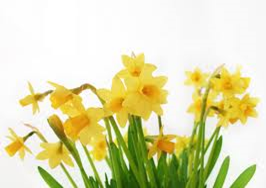 We have several other expectant grandmas this year so we will keep you informed! We like to hear of happy events so please share them with us.